Alive and Young: John McCain's MySpace Page is Pranked. 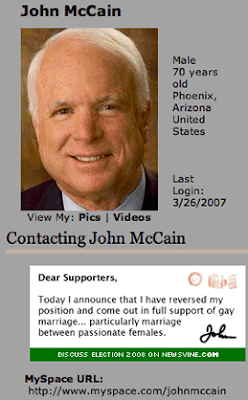 Apparently McCain was using images hosted on Mike Davidson's website. In turn every time someone entered McCain's MySpace Page it would download the images from Davidson's site using up valuable bandwidth and running up the bill for Davidson. In sort, McCain was stealing. Mike Davidson got a little annoyed, so he decided to edit his personal site a little. He changed the picture that McCain was using to read: "Today I announce that I have reversed my position and come out in full support of gay marriage... particularly marriage between two passionate females." Go Here to read Mike Davidson's account of the prank.